Properties in Lumia average 4.6 out of 5 stars. Apartment in villa lido salus 4/8 people. Property 24: Apartment in villa lido salus 4/8 people. Holiday house Sciacca terme historic center with sea view, ancient district. Property 45: Holiday house Sciacca terme historic center with sea view, ancient district. The apartment was clean, new and neat! It had a great balcony overlooking the ocean, off street parking, and comfy bedrooms. I would recommend this rental! This top floor 4brm, 2 bathroom apartment at the very end of the SecceGrande strip is indeed &ldquo;top floor&rdquo;! 180 degree views of the coast and only steps to make it into the crystal clear and azure Mediterranean Ocean. 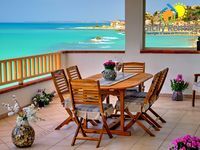 The apartment is clean and well appointed with flat screen TV and good kitchen utensils with a large balcony to enjoy the million dollar, guaranteed postcard perfect views and sunsets each evening. The only minor quibble was no microwave and TV was Italian only. The SecceGrande strip itself has a family oriented outdoor nightlife with markets, fusbal games, evening concerts and outdoor bars and restaurants. It gives you a real taste of local living with fresh vegetables, fresh fish, bread and pastries all being sold from the back of local white vans.... who needs a supermarket! Seccegrande is also only a short drive to other interesting places such as Agrigento and Selinunte. We very much enjoyed our 9 night stay here and would recommend to families and empty nesters.